Spellarium is rated 4.5 out of 5 by 36. Rated 5 out of 5 by deddu from Restore a Magical World Wonderful game with a lot of choices. You can play timed, number of moves or relaxed. There are min-games(compare two pictures, and one up or down solitaire). Rated 5 out of 5 by AverageSizeFish from Excellent Match-3 The game is very well-made, and it works quite smoothly. Puzzle-type match-3 boards are interspersed with solitaire and find-the-difference scenes (which can be skipped). You can play in relaxed, limited moves, and limited time modes. The boards require a bit of thinking to finish within the limit, but none are frustratingly difficult. The game has 100 levels, and you can replay it in the mode you didn't try the first time which makes it a good value for the money. If you like the Cursed House series, you will enjoy this game. If you like this game and haven't tried that series take a look at the second and third (the first doesn't have a timer). Rated 5 out of 5 by dfmmj from I'm in love I love this game. It is beautiful and, so much fun to play. I love the series and, I hope that there is more to come. Please keep making these games. Rated 5 out of 5 by Gamerman77 from Great Match-3 fun similar to Laruaville series! If you loved the Laruaville series this game seems to have a lot of familiar mechanics to gameplay and level design. 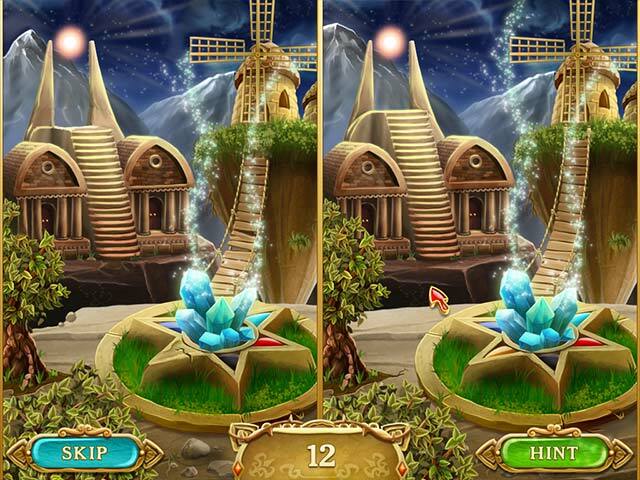 Also if you like the occasional mini golf like solitaire games, hidden objects scenes, and find the differences between two pics you can play them or skip them as well. If you enjoyed Cursed House 3 or any of the Laruaville games this is a must buy! The only con I can see so far is that you don't get to build your buildings when you earn enough coins. They are built automatically. This is only a minor complaint. I overall have enjoyed this welcoming addition to the Match-3 genre. Some things are lot of the same as Laruaville series with a few differences but doesn't take away from the fun factor of the game! Rated 5 out of 5 by KarenMora from Laruaville lovers need this one! This game is more of a challenge that the 3 Laruaville games. An improvement, although I missed the cute characters. At first it felt like it was going fast, but it actually took me longer. I didn't like the frequent bombs, but I don't play any timed games, and I'm sure they would help. Then I got to a few levels where the bombs are an absolute requirement for finishing the board. The puzzles in between match boards are better as well. All in all, delightful. I'm going to play it again now. PS: I had a note to myself that read "Level 39 "skip" a problem". But I don't remember why! Rated 5 out of 5 by Scobeaux from They nailed the important things The most important aspect of an M3 game, to me, is that the tiles be easily distinguishable. They nailed this, plus as an extra they made the tiles really beautiful. Another very important aspect is that you be able to move tiles while others are still falling. They nailed this too. The game play is extremely fluid. The graphics are gorgeous, the music is unobtrusive yet suitable, and they offer timed, move limited and relaxed mode.I am playing timed and about half of the levels I pass on the first try, others take several tries but all, so far, are doable. The one thing I really do NOT like is that you can't make a five- or six-combo by causing the tiles to fall into place - you have to place them in a five- or six- configuration yourself. This is unusual for an M3 game and makes the game much harder because in many of the levels you need to grab coins remotely with rockets and rockets can be made only by making a combo. (Except I am pretty sure they drop one in randomly if you have failed at a level several times because they don't want you to fail too many times. I could be wrong about this.) And while it is true that this game is very similar to the Laruaville games, even down to the card game and the "spot the difference" scenes, this is not a negative to those of us who love Laruaville. Rated 5 out of 5 by gyanda from wonderful nice new moves! There are people, who say this game is just like the laruaville-game by the same developer. I am now playing it quite a while, and behalve of the basic gameplay like there are obstacles etc. 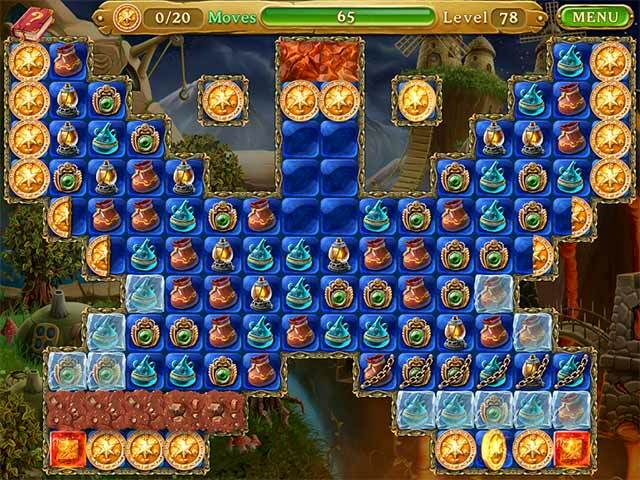 - i do find it very refreshing with very enchanting new game moves, which do give a lot of pleasure while playing them. I would have wished for the storyline that the graphics were more like in the laruaville games, it is a bit boring to see the same figure again and again telling us, that we still have to do stuff, but that's about the only complaint i have. The new moves do give this game a real great pleasure while playing, at least they did give me joy. Rated 5 out of 5 by a41249 from Very enjoyable game If you like the Laruaville Series and Floria you will like this game. This game has some of the same type things that laruaville and Floria have.It is a very relaxing game to play. Some levels are a little tricky but not impossible to do.The match 3 is like Laruaville and the scences that you restore are like Floria. I like this game. It is a keeper. Rated 5 out of 5 by 1955raven from MAGICAL FUN! I PURCHASED SPELLARIUM ONLY MINUTES IN TO DEMO. LOVE THIS ONE! THESE GAMES GET BETTER ALL THE TIME! Rated 5 out of 5 by tobysue09 from If you loved Cursed House 2 !!!! Loved the Cursed House game! Same makers and same crazy match 3 stuff!!! Awesome and tricky at the same time!! Rated 5 out of 5 by pchy from 4 * for fun! A new game from these developers, I love the Laruaville and Cursed House games and this promises to be a great new series. Thanks, guys! Rated 5 out of 5 by pennmom36 from Exactly Like Lauraville But With Better Graphics A crystal shard exists, called the Spellarium, which transforms sunlight into a magical power and brings life into our world. The Spellarium has disappeared, causing our world to decay, so Eric the wizard has been sent by the gods to work with "The One On The Other Side" to fix that which is broken. You must help Eric restore the Altar of 6 Elements and heal our world. If you are a fan of Lauraville, you will love this challenging game as well. 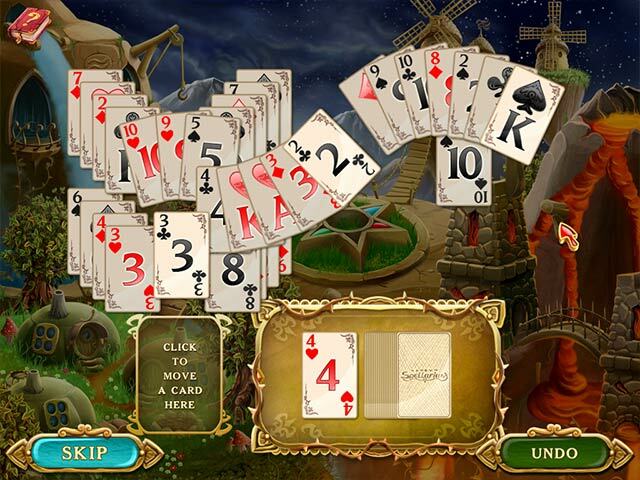 All of the features are the same, but the graphics are way better, and you get to play mini games such as Spot the Differences between pictures and Solitaire. You can play in Relaxed, Limited Time or Limited Moves modes, and I gotta tell ya, this is a challenging Match 3 game right from the get go. The object of each level is to remove all coins, but in order to do so, you will need to make several Match 5's to receive Rockets that will go after targeted coins that are located on the outside area of the board! Matches of 4 tiles will earn Dynamite that explodes to destroy those nasty ladybugs or set off chain reaction bombs, Matches of 6 tiles earn a Star that targets all tiles of the same kind as matched with, and Matches of 7 will give you a whole pack of Dynamite. Of course there are several obstacles such as Boards, Shields, Ground, Clay, Fog, Ice, and even Green Fog to make it even more challenging. Each of these obstacles require specific items to destroy, you may need to fill bottles with liquid, fill in coins with liquid gold, move keys towards locks, move coin halves to make a whole coin or even ignite a cannon. It's a really fun but very challenging Match 3 game, enjoy! Rated 5 out of 5 by thistle809 from Let this one cast a "Fun!" spell over you! Great fun! The layouts are like one or two other M-3's, but this has a lot of refinement. You have an option to turn the hints off and you can select from three difficulty levels: Relaxed, Limited Time and Limited Moves. (Difficulty can be changed during the game.) Instructions pop up when a new element is introduced and we have a Reference Guide (book) in the upper left corner of the screen that comes in handy to review what various power-ups do and what type of match produces each one. If you seem to be stuck (and you have not opted to turn off hints), the game will pop up a helpful possibility. The music is very pleasant (volume of music and sound effects can be adjusted in the Options menu) and the dialogue (written only) is sparse and sets the stage for each level as we progress. The graphics are clear and colorful enough to be fun, but not overwhelming. There are plenty of explosions and other visual effects to keep everyone awake and quite interested. Even in the Relaxed mode, strategy needs to be applied to some degree or other without being overtaxing. Some levels are actually much simpler than they first appear. As you progress through the levels, you collect coins and parts of a decimated civilization are rebuilt. Our friendly mage comes out to let us know, in very brief terms, what is happening and what is needed. The imaginative and creative devs even provided a break from M-3 action here and there to keep boredom at bay: every so often there is a very short solitaire card game or "find the differences" puzzle. Thank you, devs! This is absolutely one of the best Match-3 games is quite some time. Rated 5 out of 5 by simhaup1 from It's fun I've already bought this game from another site and finished it. It was a fun game. Not too hard at all. Rated 4 out of 5 by graceland9 from Fun Match-3 Holy power-ups and obstacles! This Match-3 has it all: rockets, dyn-o-mite, and nasty bugs. As you play, your specialty matches (crosses, match 5's) create those all-important power-ups and rockets to explode coins and buy the 6 elements. I have to admit I wouldn't have tried this game if it hadn't been for the reviews written by my awesome, amazing fellow Fishies. Thank you so much, players! And I'm glad I did - the graphics are incredible, and for a Match-3 there's a lot of action. I mean, those crates of dynamite really explode. If you need a game to fill those fifteen-minute coffee breaks, Spellarium is just the ticket. Rated 4 out of 5 by Gimlidom from Addictive game! Some people says is just a copy of Lauraville. If that was the case it wouldn't be a problem because Lauraville is a good game. The essence is the same, but it introduces some new mechanics that very well designed and more important really funny to play! I also like the option to change the difficulty ingame, so im my case I can choose the hardest one! Overall, recommended! Rated 4 out of 5 by grandmamaj from Really different match three I have only played the trial version so far, so don't have all the facts. Unless I missed the "fine print" somewhere the directions are a bit lacking and it takes a few minutes to figure out what to do. I like the different types of mini games included because match three alone can be boring. This game is well worth trying and maybe even buying. Rated 4 out of 5 by bessiegirl from From the developers of Laruaville I really enjoyed this game. It was definitely a lot like the Laruaville series, no doubt about that only this one wasn't quite as challenging. I didn't play with a timer, but maybe with a timer it would not seem to be as easy. Got tired of the card game so after three skips, the game let me eliminate playing any further games, which I thought was great. Unlike the first Laruaville, you didn't win any more gold points for playing them anyway. A long match 3 and I really enjoy building the city. A really good game for those who enjoy match 3 without dealing with a timer, but still have a bit of a challenge. Rated 3 out of 5 by RoyBoy1473 from Not that great I like to play in relaxed mode but don't want rockets and beetles going off on there own. I want to be able to make them do it on my own. I found it was like cheating when rockets spawned or beetles left during the game. Rated 3 out of 5 by campingramps from Undecided about this one I am not a fan of match 3 games unless they are truly different. This one is just that. As soon as I figured out how to play, I started to enjoy playing. It is a little frustrating at times but I still enjoyed it. The mini games are fun and not too difficult and add just enough to break up the monotony of only match 3. Colors and graphics are nice and well executed and the music is pleasant. I gave it 3 stars but could be 4 or 5 for match 3 lovers. I sort of recommend this one. Rated 3 out of 5 by emollie26 from It's Laruaville, in disguise! Game is the non identical twin, of Laruaville! Same, same, or, similar, in nearly every way. From same developer, as Laruaville. Doesn't mean we should be expected to buy the same game, with different name. Really disappointed with this 'new game.' I use the term 'new' extremely loosely. As always, just my opinion. I can't recommend a game, that I will never buy. I do recommend, try before you buy. Rated 3 out of 5 by cowclaudia from Disappointed Doubt if I would have purchased this if I had known it was by the same developer as Laruaville. I bought the first three games but got bored as it was the same game play and same goals. Tho this is a different story line still same-O, same-O. I seldom buy match 3 so was a trifle annoyed to have wasted a game coupon. For some this is great so won't rate it recommend/not recommend as it's a matter of taste. Rated 2 out of 5 by brimaz from DISAPPOINTING I feel really let down when a new match 3 game is offered, I download it, and with the very first level, immediately recognise it as a game I already own in a slightly different guise. 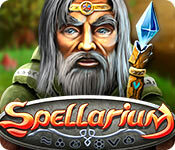 Spellarium is Laruaville 3 with different tiles and story line, but exactly the same gameplay. It's not for me. Rated 1 out of 5 by starry_lady from Horrible I tried this game on a whim because it actually looked like a lot of fun. Boy, was I wrong. It's a match 3 game, so it shouldn't be too complicated, but they just threw you into the first level without even telling you how some of the game pieces worked. I managed to finish the first level and got to the second, only to be immediately stumped because it went from relatively easy and self explanatory-ish to "whoa, what is this". It didn't even appear that there was a solution to the second level and I had to wait for the computer to point out a move for me before I could do anything. I didn't have fun with this game and I found myself more frustrated than I should have been... after only two levels. I'm not asking for an easy game, but this could've been done a lot better. On top of which, I couldn't even get the game to go into windowed mode and the edges of the game screen kept flickering! The graphics were good, music was good. That's about all that was good with this game.